We all want to eat healthy, live healthfully and be our best selves. Unfortunately, emotional eating can rob you of your best intentions. When you’re sick and tired of emotional eating, reaching for the chocolate one more time, you’re at your wits end, looking for answers again. You need quick relief from the stress, sadness and disappointment in yourself, as soon as possible! At the same time, if the solution to emotional eating isn’t a lasting change, then what’s the point? To stop emotional eating you need to truly feel good, to be at peace with yourself, your body, your life and ultimately to make peace with food for good. You know that one more diet isn’t the answer-diets can never truly heal emotional eating. You’re at a point in life where you want more than just to feel good about your body. It’s exciting to lose weight, join a new gym, read a great self-help book, but when the focus is only on losing weight and you either “fall off the wagon” or reach your goal, the excitement wears away and you’re left with—well, you—and that feeling of ‘what do I do now?’ How do I maintain without fearing the next emotional eating episode is just around the corner. You know that a whole person perspective, one that integrates mind, body and heart, would be great. You need to live with yourself and be happy. Conscious Eating is way of living in relationship with yourself that can last a lifetime. You can live a long and happy life where you feel good in mind, body and heart. You can have create a relationship with yourself, based on trust and respecting that you can listen to yourself about how to feed yourself. You can stop emotional eating and become a Conscious Eater. Fortunately, Conscious Eating supports you in making positive, life-giving changes you can integrate into your life at any time. 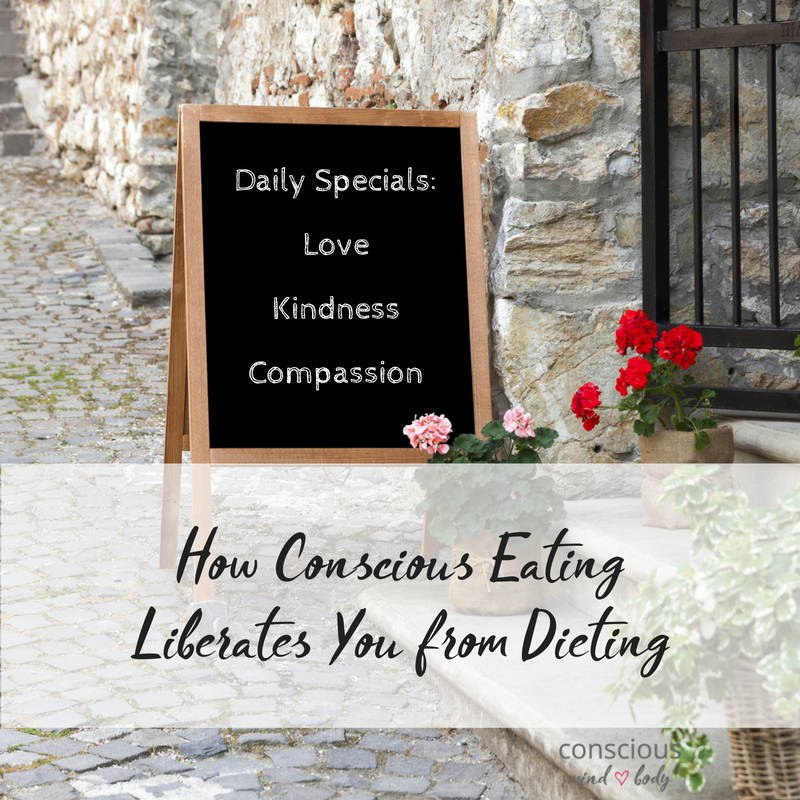 Conscious Eating is listening to your heart in the present moment, free from judgement, with the knowledge that you can provide yourself with the nourishment you need for a fulfilling life. Conscious Eating embraces respect, kindness, and compassion. Conscious Eating is the awareness that the each time you eat, you have an opportunity to pause, center yourself and come to the table for nourishment; mind, body and heart. Mindless emotional eating can be like that. Sometimes to distract, sometimes to avoid, sometimes to control feelings which seem unmanageable. Mindless emotional eating is only focused on the food, without regard for your nutrition needs, preferences, or even if you want to eat. You can stop for a moment, give yourself time and space to identify your feelings, identify what you are hungry for, and make decisions based on what will fulfill and satisfy your needs, mind, body and heart. This isn’t another diet or style of eating; this is a fundamental shift in your mindset about how you listen to yourself and take care of yourself. Making the change to Conscious Eating requires compassionate patience. The goal is to truly enjoy your relationship with food and your body, without guilt, negative self-talk, excuses or shame. Each meal is one moment in time. Food can have its proper place in your life: a part of it – yes, often a big part of it. Nonetheless, there are other equally meaningful parts of life. Sometimes you will eat purely for fuel. You are hungry, busy, and just need to get some nutrition in your system to function well. Knowing when you need to be quick and efficient verses when you can savor your meal is part of Conscious Eating. There is no such thing as a perfect eater! You may have days where there is one meeting after another and your energy needs are met through one energy bar after another or one cup of coffee too many. You may have days where what’s available isn’t appealing and you need to take care for your body anyway and have a meal from what’s available. Sometimes we eat just for energy and that’s OK.
During times like these Conscious Eaters are kind and compassionate, knowing that they are making the best decisions they can at the time. It’s not the end of Conscious Eating; it’s getting on with your life. You can nourish yourself with food with the confidence that you will have many more opportunities to enjoy the foods you love to eat. You can get back to listening to your natural rhythms. Becoming a Conscious Eater is often like getting back to nature. Eating more naturally, most of the time. It is like when you were little and you ate because you were hungry and stopped when you were full. Even when you had something delicious, like your favorite food, you listened to your body and stopped when your body let you know it was full. And if this was not your experience growing up — maybe you never learned to listen to your body — you can learn how to listen now. Conscious Eating is a skill that you can develop at any time in your life. Emotional eating is a habit you can unlearn at any time too! There’s a point in life when you really know it’s not about weight or how you look in the mirror. It is more about how you want to live with yourself. Conscious Eating is the relationship you have with you, how you talk to yourself, how you feel about your body and your life. It’s difficult to break free from criticizing your body, emotional eating or the diet mentality. The solution isn’t easy. Freedom from mindless emotional eating takes effort. The reward for becoming a Conscious Eater is to experience the fullness of what you desire. Your life is yours to live right now-no longer being ruled by your feelings and led down the road of emotional eating one more time. You honor your life every time you have the courage to risk listening to yourself. There is a wealth of knowledge about good basic nutrition. Your challenge is to work within the parameters that fit for you. Respect any adjustments you may need to make given your specific health concerns. This is a process of increasing awareness, making adjustments, and moving forward with new knowledge. There is no one size fits all; there is only what best fits you. Most of all, Conscious Eating is natural, kind, and filled with peaceful self-compassion. Conscious Eating breaks your habit of dieting and leads to a calmer, more reasonable, thoughtful relationship with food. Often when women talk about, “my relationship with food” it comes from a position of power – the food having more power. The diet mentality, (there are good foods/bad foods, healthy/unhealthy food, the need to count calories, fat, carbohydrates, gluten or whatever is the “baddy” of the moment), leaves your knowledge and wisdom about yourself out of the equation. There is a see-saw back and forth, between knowing that you need to follow your own path versus the overwhelming messages that this plan or that diet will be “the one,” never really reaching a balance point in the middle. This the one of the vulnerabilities of emotional eating. Consciously making decisions that are guided by your self knowledge. The struggle comes from the inability to integrate the latest diet fad into your life. When sweeping changes come with, “I start my diet on Monday,” it is just too much of a jolt to the system. Making changes gradually over time and allowing yourself to adjust to change, step by step, is usually more successful. Many women have been brought up with the cultural idea that to feel good about yourself and your body is not possible. You may have grown up believing that you are supposed to look a certain way or that there is one body type that is acceptable and if your body does not match up…well, how could you ever feel good, never mind accept yourself? Conscious Eating is grounded in caring and compassion and provides nourishment, not only your body with food, but also your mind and heart with peace. What is your body is asking for? What do you need to nurture your whole self? What is your energy level in relationship to your planned activities? What type of fuel do you need now—food, motivation, inspiration, peace, etc? What are your emotional needs? It can be difficult to thoughtfully answer these questions in the beginning. Sometimes you are swept up by emotions, thoughts, and memories, and are unclear what will calm your anxieties and fears. Longing for food can seem uncontrollable at times. The way out is to allow yourself some space, a break, to figure out what you need and how to nurture yourself as you experience it. Give yourself time and space to let the questions simmer. Give yourself the gift of thoughtfulness. 1. Mind – how your thoughts are shaped by your feelings? Most of us have the basic feelings down; mad, sad, happy, bored, etc. One of the great things about Conscious Eating is that you learn to be more specific in identifying your feelings. With increased emotional awareness your emotional vocabulary grows and leads to more options on how to best work with them. Rather than using food to calm or elevate your mood you have many choices available. For example, there are many ways to describe happiness. Joy, elation, glee, delight, well-being, merry, etc. Each of these feelings have a different quality and are different experiences of happiness. Increasing your repertoire or vocabulary of emotions gives you the opportunity to match the feeling with positive action. You can work with the emotion and move your life in the direction you need. Fulfillment, happiness, and peace in your relationship with food is possible, because now you are taking care of your emotional health in ways that directly address what is missing. 2. Body – How do you physically feel? Conscious Eating naturally leads you to check in with your body, with kindness and compassion on a regular basis. You will get to know your subtle and not-so-subtle hunger cues, your need for movement, flexibility, sleep, etc. Most importantly you respect the information your body communicates and follow through with your need. A healthy relationship is built on a foundation of trust and mutual respect. Your relationship with your body’s hunger and satiety signals needs trust and respect too! To be a Conscious Eater you need to stop, listen, and take good care. Allow yourself the time to check-in and wait for an answer. Remember, snap judgments lead you away from consciousness. The gift of listening to your heart is one of the guiding elements of Conscious Eating. This is where you will find the gentle strength of discernment. With experience and practice you will come to know when a craving leads to, “I just want it,” rather with a thoughtful centered perspective. You can ask yourself, “am I using food, exercise, focus on the number on the scale, counting calories, etc. to calm an uncomfortable feeling or do I really just have a craving?” Choices are no longer difficult. The heart of Conscious Eating is a movement toward your own self, that you know from your core what is best for you. The tug of war no longer exists. You live your life with increasing peace and clarity. You take into account what you need, whether it is caring for your emotions, feeding yourself, space and quiet time, engaging in a physical activity you find nurturing, etc. You deepen your relationship with yourself in a new way that brings happiness. Now you know what Conscious Eating is and how it works. Most importantly you have the benefits of how Conscious Eating can bring more calm, happiness and peace to your life.